• In Colorado’s 28-21 win over Arizona State, Shenault caught 13 passes for 127 yards and 2 TDs, while rushing 5 times for 13 yards and two more scores. • This was his fourth 100-yard receiving game of the year; the only other two players in CU history to have four 100-yard games in the first five games in a season were Michael Westbrook in 1992 and Nelson Spruce in 2014. • He has caught at least one TD pass in all five games this season; that ties the second-longest streak of consecutive games with a TD reception in school history. • He is the first player in Colorado history to score multiple touchdowns rushing and receiving in the same game (the 15th four-plus TD game at CU); it was his first multiple receiving TD game of his career, and he is now the third player to have four or more of each in the same season. • He now has 51 receptions for 708 yards (five games); he has one receiving TD in all four games. • Shenault is the fifth receiver to earn the Pac-12 Offensive Player of the Week honor twice in the same season. Utah Utes corner Jaylon Johnson (1) intercepts the ball on the goalline before taking it back 100 yards for the score on Saturday, October 6, 2018. (Photo by Aaron Nelson / fi360 News). • Johnson tallied seven tackles and one interception return for a touchdown in the 40-21 win at No. 14 Stanford. 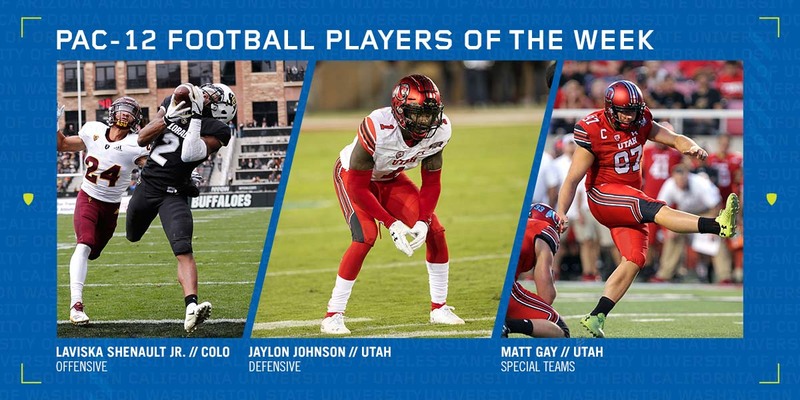 • He became just the third Ute in history, and the first since 1994, to return an interception 100 yards for a touchdown. His interception return for the touchdown came in the second quarter with Stanford on the Utah 9-yard line and the Utes clinging to a 7-0 lead. • Johnson’s 100-yard interception return is the longest in the nation this year. • Gay was integral in Utah’s 40-21 win at No. 14 Stanford, making 4-of-4 field goals, including back-to-back kicks of 48 and 49 yards to end the first half and the start the second half. His 49-yard field goal was a season-long. • Gay’s other field goals were from 34 and 37 yards putting him at 4-of-4 made field goals inside the 40-yard line this season and 25-of-26 in his career. • Gay also made 4-of-4 PATs giving him 16 points on the night. • Gay ranks first in the Pac-12 in field goals per game (1.60) and is tied for first in the league in kick-scoring points per game (7.8).